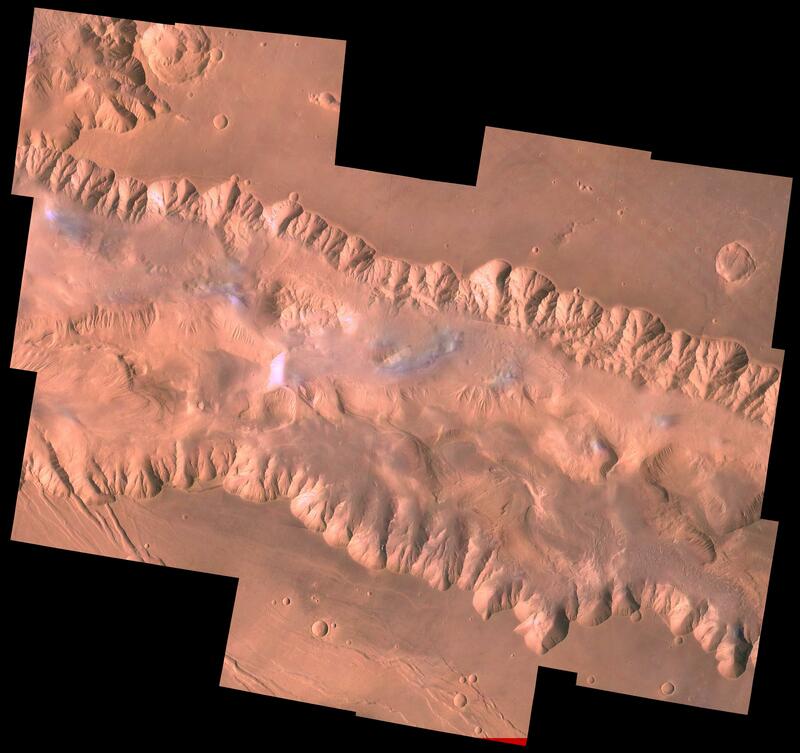 During its examination of Mars, the Viking 1 spacecraft returned images of Valles Marineris, a huge canyon system 5,000 km long, up to 240 km wide, and 6.5 km deep, whose connected chasma or valleys may have formed from a combination of erosional collapse and structural activity. 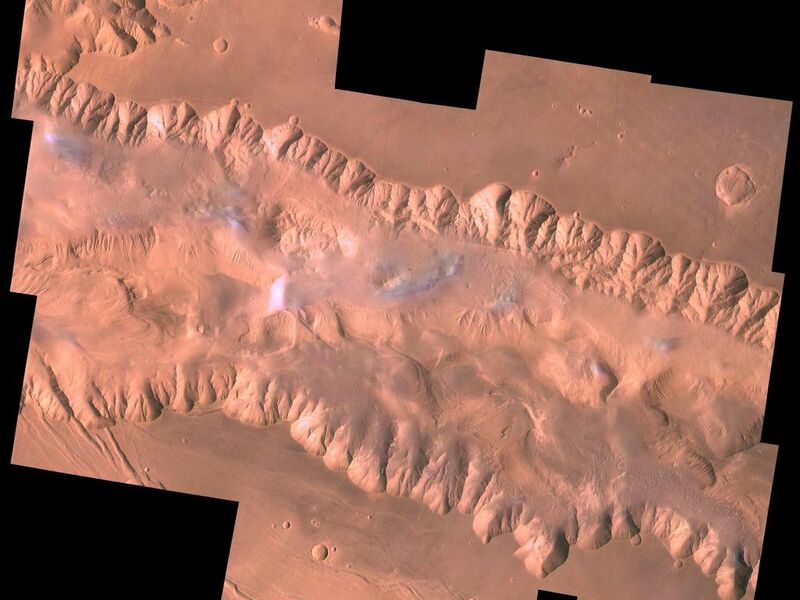 The view shows east Candor Chasma, one of the connected valleys of Valles Marineris; north toward top of frame; for scale, the impact crater in upper right corner is 15 km (9 miles) wide. The image, centered at latitude 7.5 degrees S., longitude 67.5 degrees, is a composite of Viking 1 Orbiter high-resolution (about 80 m/pixel or picture element) images in black and white and low-resolution (about 250 m/pixel) images in color. The Viking 1 craft landed on Mars in July of 1976. East Candor Chasma occupies the eastern part of the large west-northwest-trending trough of Candor Chasma. This section is about 150 km wide. 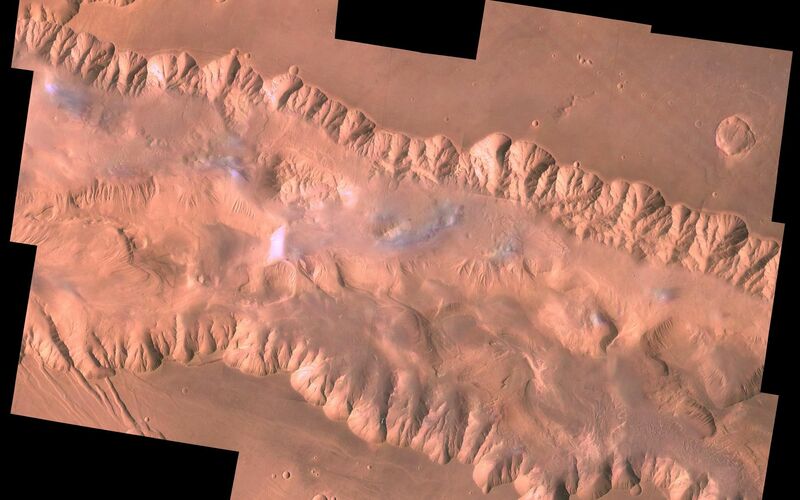 East Candor Chasma is bordered on the north and south by walled cliffs, most likely faults. The walls may have been dissected by landslides forming reentrants; one area on the north wall shows what appears to be landslide debris. Both walls show spur-and-gully morphology and smooth sections. In the lower part of the image northwest-trending, linear depressions on the plateau are younger graben or fault valleys that cut the south wall. Material central to the chasma shows layering in places and has been locally eroded by the wind to form flutes and ridges. These interior layered deposits have curvilinear reentrants carved into them, and in one locale a lobe flows away from the top of the interior deposit. The lobe may be mass-wasting deposits due to collapse of older interior deposits (Lucchitta, 1996, LPSC XXVII abs., p. 779- 780); this controversial idea requires that the older layered deposits were saturated with ice, perhaps from former lakes, and that young volcanism and/or tectonism melted the ice and made the material flow.